How do we turn profound emotional experiences into action? 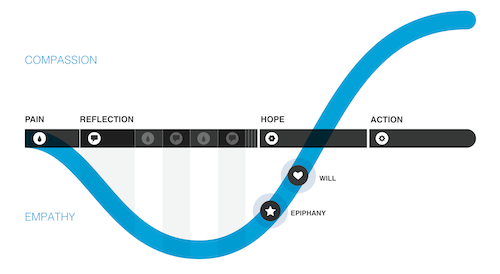 The Inzovu Curve maps a prototypical journey of a person going through the transformative experience of a museum reaching a state of motivation and action. A museum is more than a collection of interesting objects. A memorial is more than a heap of marble or stone. Each of these types of institutions exist to serve a greater purpose. They create an experience that is meant to inspire some action on the part of those who visit them. Carefully observing these young people, the designers developed a model the Kigali museum — and all museums — can use to convert profound emotional experiences into action. This is the story of that model. Do you want to do a workshop mapping and designing a museum experience using the Inzovu Curve? Here’s the workshop plan. UX for Good leverages the discipline and top practitioners of user experience design to help solve pressing, complex social challenges.